Shrinking glaciers, Arctic temperatures and a mix of messy energy politics await President Barack Obama on his historic trip to Alaska. Even before he departed, Obama was making waves with a decision to rename Alaska’s famed Mount McKinley despite a backlash from Ohio politicians. Obama flies to Anchorage on Monday morning for a three-day tour of the nation’s largest state, closely choreographed to call attention to the ways Obama says climate change is already damaging Alaska’s stunning scenery. By showcasing thawing permafrost, melting sea ice and eroding shorelines, Obama hopes to raise the sense of urgency to deal quickly to slow climate change in the U.S. and overseas. His excursion north of the Arctic Circle will make Obama the first sitting president to step foot in the Alaska Arctic, home to Alaska Natives who have received less attention amid Obama’s recent efforts to improve conditions for Native Americans. 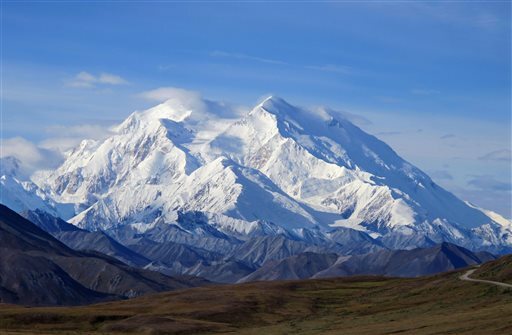 In a major show of solidarity, Obama announced on the eve of his trip that his administration is changing the name of North America’s tallest peak, Mount McKinley, to Denali, its traditional Athabascan name. Obama’s move to strip the mountain of its name honoring former President William McKinley, a son of Ohio, drew loud condemnations from Ohio lawmakers, including House Speaker John Boehner, who said he was “deeply disappointed” in the decision. “This political stunt is insulting to all Ohioans, and I will be working with the House Committee on Natural Resources to determine what can be done to prevent this action,” added Rep. Bob Gibbs, R-Ohio. In renaming 20,320-foot Mount McKinely as Denali, Obama was instating a moniker Alaskans have informally used for centuries. The name means “the high one” in Athabascan. Yet Obama was to navigate far more turbulent political waters when he arrived Monday afternoon in Anchorage, where his grand declarations on climate change have been met with skepticism by leaders in a state that’s heavily dependent on oil revenues that have fallen precipitously. At the same time, environmental groups warned in the lead-up to Obama’s trip that he hadn’t done enough to protect Alaska and the climate. They took particular offense at his administration’s move just a few weeks ago to give Royal Dutch Shell a final permit for expanded drilling off Alaska’s northwest coast. “I share people’s concerns about offshore drilling. I remember the BP spill in the Gulf of Mexico all too well,” Obama said in his weekly address. Yet he said the economy still had to rely on oil and gas while it transitions to cleaner renewable fuels, and said his administration was ensuring risks were minimized. Although mindful that the Shell issue would likely come up, White House officials said Obama intended to keep his visit largely focused on climate change. Yet as a State Department-sponsored summit on Arctic issues opened on Sunday, Alaska Sen. Lisa Murkowski, a Republican, sought to shift attention back to Alaska’s energy needs. “I want to highlight one aspect of Arctic policy that I hope will be at the forefront of the discussion: the people who live in the region, and their need for sustainable economic activity,” Murkowski said, praising oil revenues for funding advances in medicine, communications and basic infrastructure. After touching down in Anchorage in the afternoon, Obama was to hold a listening session with Alaska Natives before speaking at the climate-focused Arctic summit, which involves leaders from Arctic and non-Arctic nations. Setting the stage on Sunday night, Secretary of State John Kerry told reporters in Alaska that climate change skeptics won’t be remembered kindly. “I think the people who are slow to come to this table will be written up by historians as having been some of the folks most irresponsible in understanding and reacting to scientific analysis,” Kerry said. Obama and Kerry are intensely focused on a global climate treaty that nations hope to finalize in December, as the president works to secure his environmental legacy before leaving office. The president has pledged a U.S. cut in greenhouse gas emissions of up to 28 percent by 2030, compared to 2005 levels, and planned to use the Alaska visit to press other nations to commit to similarly ambitious measures. Following his speech, Obama was to embark on a camera-friendly boat tour Tuesday of Kenai Fjords National Park and to hike to Exit Glacier. The sprawling expanse of ice is retreating, in what environmentalists say is a dramatic sign of warming temperatures. At least the folks in Ohio are complaining know who McKinley was. I heard grumbling about this last night by people who, as it turned out, had no idea. They just didn’t like the fact that Obama was doing it.